Dr. Aleia Brown: The African American Quilt making Tradition. You are here: Home / Events / Events / Dr. Aleia Brown: The African American Quilt making Tradition. 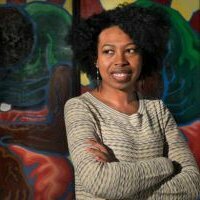 Dr. Aleia Brown, Program Manager at Humanities Action Lab, will discuss the African American quilt making tradition. Narrative quilts are conversant, often documenting a historical event, while also issuing commentary on the present and inviting viewers to reflect. Part of the Humanities Iowa presentations.